I never liked animal prints. I thought they looked old, tacky, busy and trying too hard. Last January, I went to Anne Fontaine, one of my favorite stores, to check out their winter sales. There was a dress in a silhouette I like. The discount was hard to resist(from about 400+ to 100+). The only downside is that it is in a kinda of animal printish pattern. I decided to give it a try. This dress is a revolutionary item in my wardrobe. From this dress onward, I started paying attention to animal prints. The result? 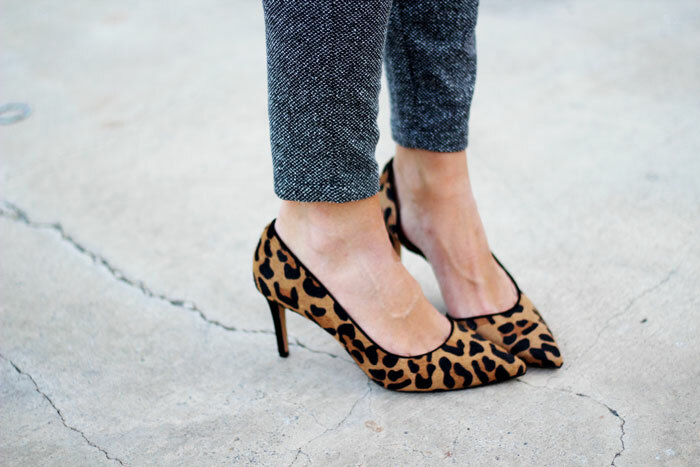 Four items in animal prints in 2014. Item No. 2: Michael Kors Animal Prints Slim Leg Jumpsuit. (The photo is from macys.com, but it is already sold out there. I bough it at about $120. LordandTaylor.com currently sells it at $75.37). Item No 3: Michael Kors Animal Prints Sweater Dress (I bought it at $80 and it is now only $65.9 at Nordstrom). Item No 4: Halogen Marlie Pointy Toe Pump (Bought it during Nordstrom’s anniversary sale. The brown leopard version is sold out. The grey leopard version is still available.) The following photo is from Mint Arrow and the darling detail also has a beautiful post about this pair of shoes). These purchases have totally changed my view toward animal prints. When done right, clothing items in animal prints can be so classy yet fun, elegant but also with a touch of sexiness! Do you like animal prints? Love to hear your thoughts. Thank you so much for reading! Disclaimer: I don’t get any commission from the items recommended above. Sharing items I love is rewarding on its own! Case Study 1: Am I saving enough? The AF dress looks beautiful. I like the subtle animal print. I love, LOVE leopard. Especially Tom Ford era YSL leopard. Thank you! The YSL Tai Tai Wedge you have is so beautiful. IMHO, the perfect leopard should have just the right amount of black and the right kind of brown. Tom Ford is very talented indeed! I am reading the book “The Beautiful Fall” by Alicia Drake and am so impressed by the fashion vibes in the 60s and 70s. It is interesting how these fashion power houses are transformed by their lead designers. Love your blog! I feel so related to your posts! Those are awesome finds! Love them! Jane, thank you so much for stopping by!